Not to be outdone by the HTC HD7, the Dell Venue Pro is set to receive the the NoDo update starting today with a separate firmware update “coming later.” While the NoDo update has a set list of fixes, the separate firmware update will hopefully focus on a long list of issues that have hampered the handset since its release. 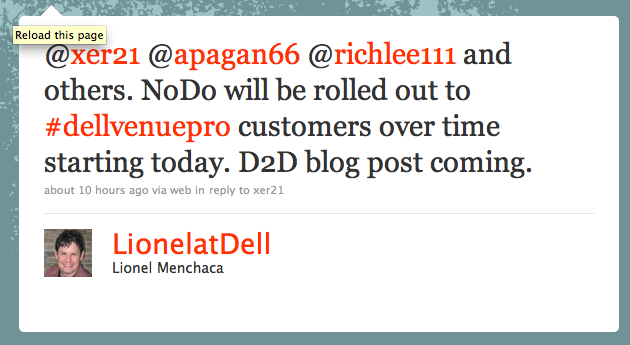 This comes down from the Chief Blogger for Dell, Lionel Menchaca who tweeted the details regarding the NoDo and separate firmware update late yesterday. Even though Tmo has nothing to do w DVP’s updates… lol Whatever. Phone is still used on tmo so that counts enough for me. No doubt. They do like to make us First! I guess not alot of window phone 7 users. hehe. Are people not buying Windows phones or is this upgrade not that important? I would imagine this place to be flooded with comments if this was an upgrade for one of the Android devices. Specifically the Venue Pro must not be selling. Atleast the HD7 post has some activity. That thing is not in TMO stores is it? I love my Venue Pro. it’s fast and the screen is beautiful and I like the option of a physical keyboard, but it was a struggle to purchase. T-Mobile customer service knows little to nothing about it. I was asked if it was tablet or a netbook. they had no idea their company had a deal with dell to sell this phone. The Dell reps were great, but it was painful Jujitsu to renew my 2-year contract with t-mobile by getting two Venue pros on the dell site, agreeing to a more expensive t-mobile plan there and then going back to t-mobile trying to explain what I did and and having them adjust it to more favorable terms. it all ended well but the process was torture, frankly. Iove this phone, though. will love it more after the firmware upgrade because it does freeze a lot. Hey that’s good to hear. It’s a really nice looking phone but I’ll probably never see one in person. No most people already have the update the day before I got mine. Personally, I am frustrated that the update has not been sent to WP7 users. I bought my WP HD7 the first day of the release from T-Mobile. I own the Iphone 3g before and thought I was really getting a better phone to fit my lifestyle. Don’t get me wrong the phone is superior at least in my book but it has yet to provided the promises that I expect and that is for he update. Copy/Paste is really something that I miss from my Iphone 3g. I think folks are upset and really just like…….’Whatever’ or at least I am…..if it comes, it comes, if it doesn’t then it doesn’t…we all have been lied too once or twice about the update before so “the boy cried wolf” or MS did:).. At this point I would like to jailbreak it and run Android O/S at this point and call it A-Day! I am not defending Microsoft or anything like that but their way of doing things will cause such delays in the long run. People complain all the time about google not controlling the upgrade process for Android phone but they forget that’s almost impossible. Android being out as an open source project means someone can put together any hardware and install Android on it. So if we end up with 200 Android phones on the market, we want google to be responsible with upgrading all of them? Even if they nothing about the hardware specs? That to me is not possible. They have developed the software and added features that people want. They want everyone to use it for free, modify it, do whatever you want with it. We can’t expect them to also upgrade your modified software (BLU and TOUCHWIZ) for FREE. This is why I give google a pass on this whole upgrade thing. If you want an upgrade from them, buy a Nexus device. Now, on Microsoft’s end, they decided to come up with a set of hardware requirements and license the software. However, they still need to modify and test their software on the handful of devices out there. That takes time. Apple can do this in a timely manner because they have one or two devices to deal with. Microsoft might have been naive the first time they announced a date for this NoDo update, I’m sure they needed more time to test the software for the different OEM’s. I expect updates to take even longer as more Windows Phones come out. I rather they take months to perfect upgrades for each specific hardware than push an update that might brick my $400 device. Im a winpho 7 and proud!!!!!!!!!!!!!!!! !